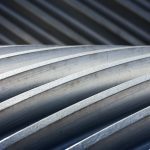 Arrow Gear describes how the use of advanced design technology is expanding its range of power transmission applications in a wide range of environments. 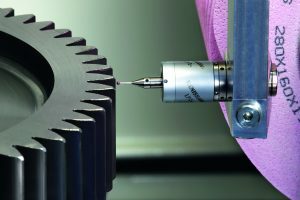 As with many other industries, ongoing advancements in the precision gear industry are bringing about a paradigm shift in the way gearing products are manufactured. Arrow Gear Company—widely known as an innovator in the gear business, and among the most technically advanced facilities in the world—is pushing forward into the next generation of production technique for bevel gears. 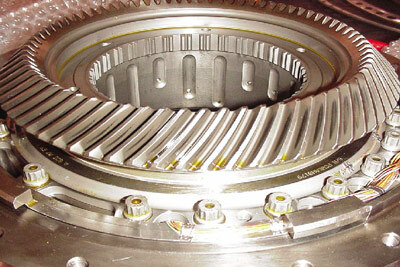 Arrow produces more loose gears for aircraft jet engines than any other gear manufacturer. 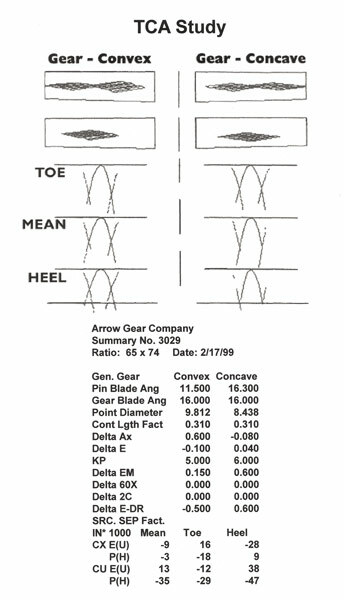 In 2002 Arrow first reported on a new, fully integrated system at their plant that showed a great deal of promise as the next generation of methodology for producing gears. At that time they had just completed work on a new gear design for an aerospace customer. The results of Arrow’s work on the project were heralded as a dramatic savings of both time and expense. In fact, Arrow was able to complete their design, development, and manufacturing work in just six months, as compared to the conventional 10 months, while producing a design that performed with exacting quality and precision. Now, six years later, Arrow has continued to fine-tune this technology and has a 100-percent track record of consecutive successful development projects. 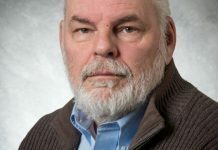 However, what was once primarily an aerospace-oriented capability is now being used by Arrow for a broader range of systems, including land- and water-based power transmission applications. What is this gear production technology, how is it used, and just how far will it reach beyond the aerospace industry? 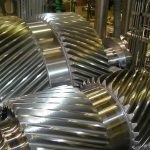 To answer these questions one must first understand the complexities of the process of developing and designing spiral bevel gears. 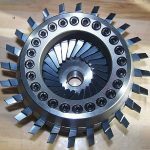 A critical attribute of a spiral bevel gear’s design is its contact pattern. Simply stated, the contact pattern is the area in which the gear teeth come in contact as they engage and disengage during their rotation. 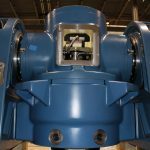 When a gear is installed in a gearbox and is powering the designated application, there are varying degrees of pressure, or loads, on the gear teeth. 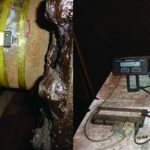 These loads are affected by box deflections, bearing movement, and temperature changes. 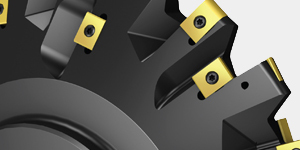 When the gear teeth are subjected to these variables, the contact pattern will change. This is where the issue of contact pattern becomes so important. For a gear to perform properly under load, the contact pattern must be a certain shape and at a certain location. 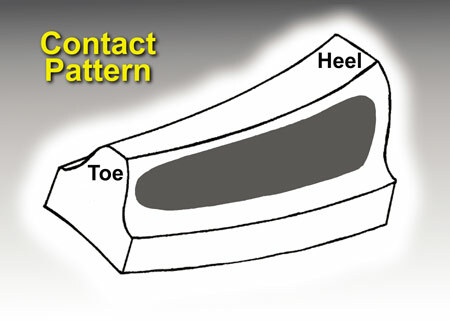 Typically, an ideal tooth contact pattern under load should encompass the bulk of the tooth surface while avoiding any contact with the edges of the tooth surface or the radius in the root of its mating part (Figure 1). 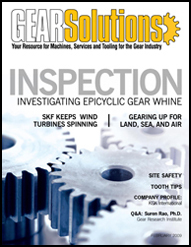 Another critical issue to consider when assessing how the contact pattern will perform in an operating gearbox is gear displacement. In the operation of many gearboxes, the gears and their shafts do not remain in a fixed orientation. Thermal forces and stress from being under load can cause significant movement of the gearbox components from their original positions. There are typically four different types of movement that can take place. These types are described as offset, pinion in and out of mesh, gear in and out of mesh, and shaft angle (Figure 2). 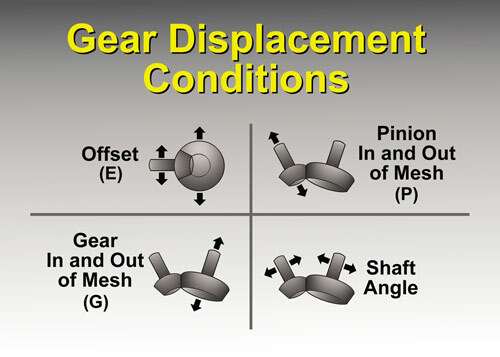 It is this movement that is referred to as gear displacement, and it can occur in any combination of the four types. 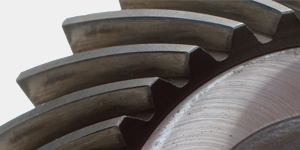 The size and position of the contact pattern has always been a primary design consideration for gears. And for many years, achieving a good contact pattern was performed through the same methods that the vast majority of gear producers still use today. The conventional method of achieving an ideal contact pattern is performed in the following way. 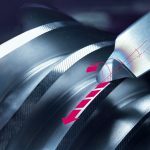 First, an engineer will make an educated guess at the gear tooth geometry required to provide a correct contact pattern. Typically this is a 40-60 percent central toe, non-loaded contact pattern. Next, the part is fabricated and the gear teeth are machined to an undeveloped summary of machine settings. When the gear and its mating pinion are finished they are run together in a tester. More often than not, the contact pattern will not be correct in this first attempt. This requires going back and changing the settings on the gear tooth grinder, then producing a new pinion. The parts are checked again. This trial-and-error process can continue through many cycles until the best educated guess for contact pattern location is achieved. But how will the gear perform under load in a gearbox, and what will the contact pattern look like then? Answering this question leads to more steps in the trial-and-error process. First, the gears are mounted in the gearbox and run under light to medium load to determine the contact pattern movement. Then the gears are visually inspected to check the contact pattern, which is indicated by a light wear pattern on the mating tooth surfaces. If the pattern is not correct, which is commonly the case, the gear tooth grinder has to be set up again with new machine settings, and another pinion is ground. This cycle continues until a suitable contact pattern is developed when run under full load. For a new gear design this process can take several months to complete. 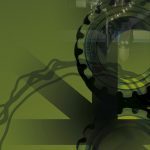 And while this is a time-consuming and costly process, it was just the way it had to be done—or it was, until new computer-based technologies for gear development became available. To address the traditional limitations of conventional methods, Arrow Gear implemented a highly advanced system for performing contact pattern development, a system that provides a dramatic reduction in the time and expense of the process when compared to conventional methods. 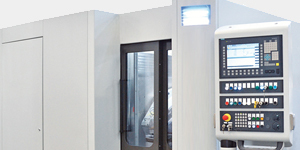 This system uses a combination of state-of-the-art development software and machine tools. 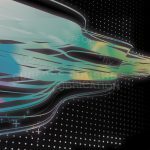 Among its key components are The Gleason Works’ G-AGE, CAGE, MINIGAGE, loaded TCA and T-900 finite element analysis software packages. 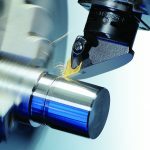 And for machine tools the system utilizes Gleason Corp.’s Phoenix® CNC tooth cutters and Phoenix CNC tooth grinders, in conjunction with a Zeiss-Höfler CNC gear inspection system. More detailed information on the use of this system will follow, but here are a few highlights of its capabilities. Using the development software, engineers can build virtual models to predict how the gear will perform in actual operation. This in turn generates the settings to be used by the machine tools. In addition, these settings for the machine adjustments are automatically downloaded to the machine tools, greatly reducing the time spent on setup. 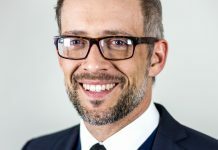 Perhaps the most dramatic aspect of this system is that ideal settings of the machine tools—which are required to produce the desired contact pattern—are typically achieved in the first or second attempt on the gear manufacturer’s shop floor. 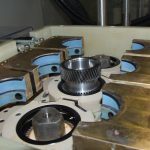 In essence, this system eliminates the two step trial-and-error process that was once required to first perform the initial development on the gear grinding machines, and secondly to achieve an acceptable full load contact pattern on the final product. 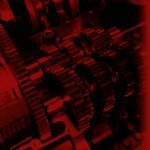 The bottom line is that development time is reduced, and the gear producer is able to provide a significant cost savings to the customer. The process of developing a contact pattern with this system is very complex. However, to provide a clear understanding of how the system works, the conceptual highlights of a typical development will first be presented. 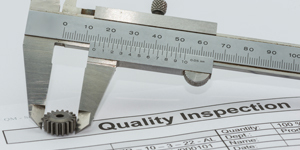 The process begins by receiving the customer’s design requirements. 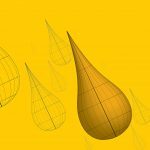 This would include drawings of the part detailing the critical geometry, such as ratio, diametral pitch, and so on. In addition, it is helpful if the customer can supply specifications on operating torque and the gear displacements. Engineers begin the process of contact pattern development by establishing a working file for the part based on its geometry. Using the CAGE software, a tooth contact analysis study, or TCA study is performed (Figure 3). 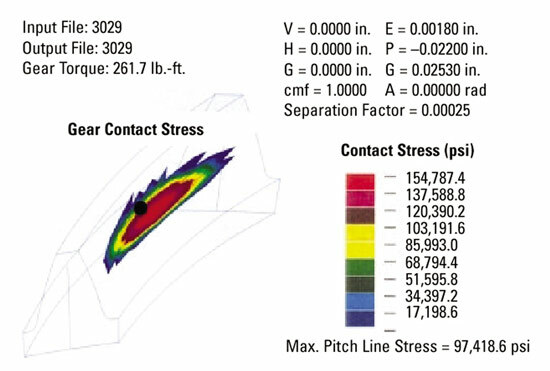 This indicates the location of the contact pattern without load. Finally a loaded TCA is performed, taking into account all the displacement conditions (Figure 4). Once the TCA study is performed for all displacement conditions, the ideal contact pattern is identified. 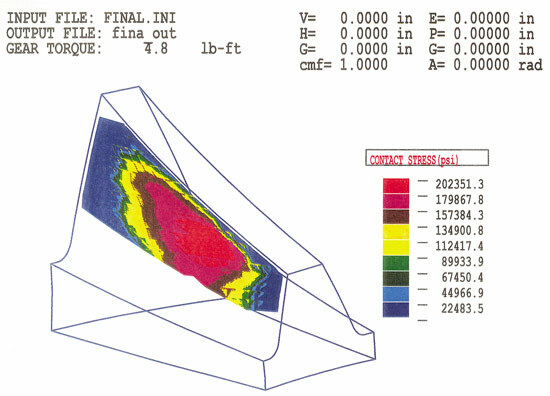 With this information, a finite element analysis is performed that predicts real stress on the tooth surface as well as the root fillet (Figure 5, Figure 6). 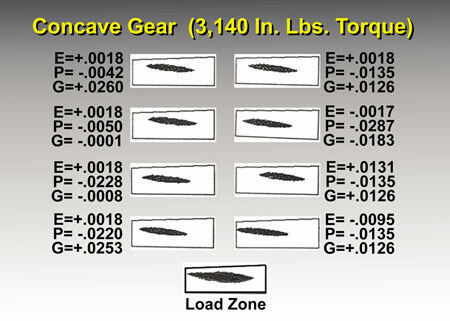 This study allows the engineers to determine whether there is a potential for failure resulting from excessive or nonuniform pressures anywhere along the line of engagement of the gear tooth (Figure 7). This advanced approach for design and contact pattern development provides numerous customer benefits. Foremost among these are dramatic savings of time and money. An example of these two benefits to the customer was illustrated in Arrow’s involvement with the previously mentioned aircraft jet engine project. The details of this project are presented in the following case study. Arrow supplied gearing on two locations of the engine. The first bevel gear set was used in the upper tower shaft or power take-off. The second bevel gear set was used in the accessory gearbox. As this was a new engine, Arrow was called upon to perform both the gear tooth design and the fabrication of these bevel gear sets. As with all jet engine gears, this was a demanding application due to the high degree of gearbox deflections. 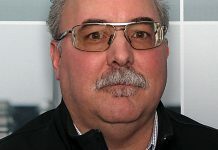 Faced with the double-edged challenge of both a difficult job and a short lead time, Arrow began work on the project utilizing the design and manufacturing tools explained earlier. The two different gear sets were then produced and shipped for installation in the engine. Here are the results. First of all, a normal time frame for developing the desired contact pattern under full load can be up to six months. Utilizing the initial computer generated model, Arrow manufactured the prototype gear sets, which were placed in the gearbox and run under full load during engine tests without requiring any modifications to the contact pattern. 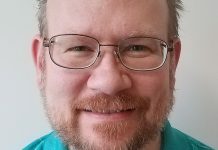 Resulting from their advanced technology, Arrow was able to save its customer tens of thousands of dollars, and they were able to get their engine to the marketplace several months earlier than past performances. After the gears were run in the engine for 75 hours, they were visually inspected (Figure 8). Both contact patterns on the run side and start side were exactly as predicted. 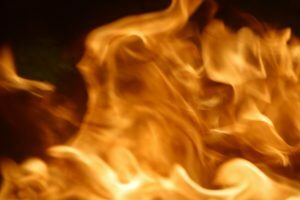 This approach saved a significant amount of expense and time for the company creating the engine. This system for designing gears is used for the most part to design or improve designs on new or existing gear sets. However, there are additional capabilities of the system. 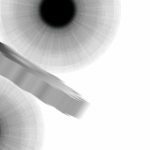 If the system is provided with the proper information, virtual models of the gear teeth can be created to predict the proper location of the contact pattern. This information, compared with the actual contact pattern, can provide valuable insight to the cause of a failure or other problems. In addition, this approach can improve beam strength of the tooth up to 30 percent and significantly increase gear life. 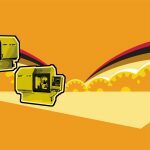 In today’s competitive manufacturing environment customer demands for fast delivery and lower costs are prevalent. 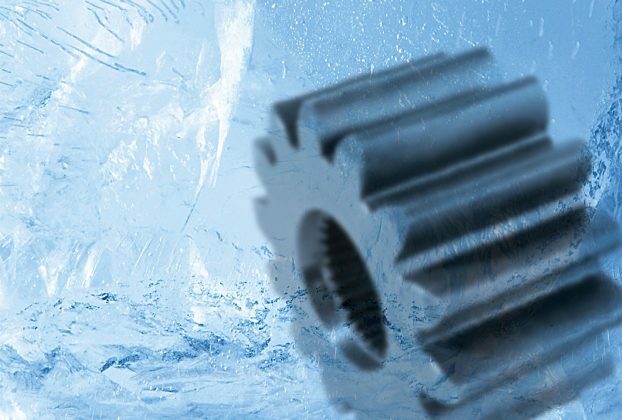 The computerized closed-loop approach to gear production is ideally suited to this climate. 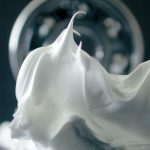 In addition, by reducing development time, this technique allows the product to be released to the market much sooner, substantially reducing costs to the OEM. 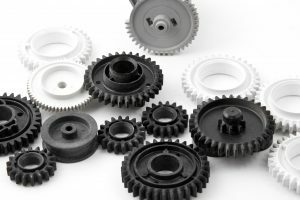 In view of the numerous benefits of this technology, the closed-loop methodology promises to become the standard development technique in the gear industry for years to come.